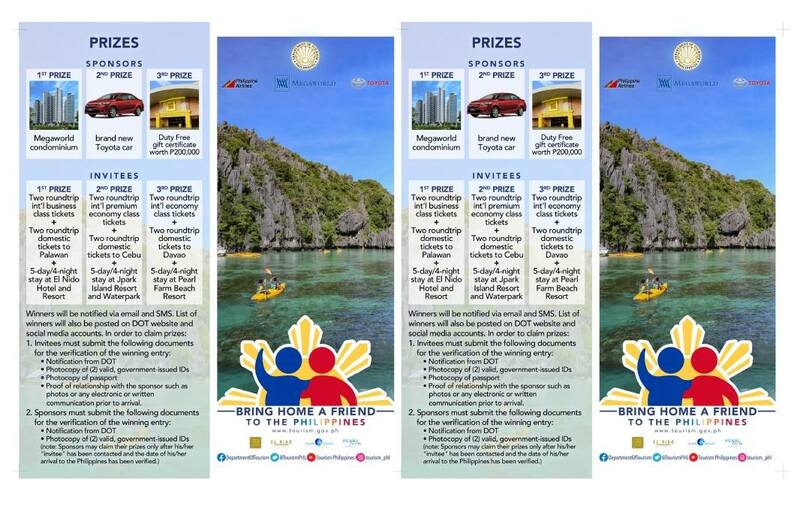 The Department of Tourism (DOT) is reviving the “Bring Home A Friend to the Philippines” campaign program that aims to encourage all Filipinos and expats residing in the Philippines and Filipinos living abroad to help promote tourism by inviting their foreign friends to come and visit the Philippines. This campaign is a referral incentive program wherein three (3) sponsors, Filipino or Philippine expats who invite foreigners to visit the Philippines, will have the chance to win a condominium unit from Megaworld, a brand new Toyota Vios, or Duty Free certificate worth Php200,000.00. Furthermore, three (3) invitees will likewise have the chance to win exciting prices namely roundtrip international air tickets to the Philippines together with roundtrip domestic air tickets and hotel accommodations all for two (2) persons to either Palawan, Cebu, or Davao. Should you have any inquiries, you may contact Jake Velasco or Cheanrie Navida email address japs@7107.co.kr or cheanrie@7107.co.kr.